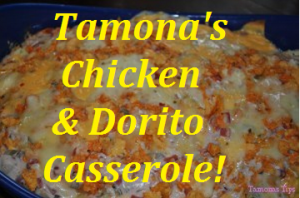 Chicken and Dorito Casserole - Make Something Monday! You are here: Home / Recipes / Chicken and Dorito Casserole – Make Something Monday! Chicken and Dorito Casserole – Make Something Monday! A great friend of mine asked that I post the recipe for Chicken and Dorito Casserole. Please do NOT call this King Ranch Casserole because I have respect for the recipe but this is NOT King Ranch! My mother makes her Chicken and Dorito Casserole this way but I do know many people who use Velveeta (LORD help’em)! 1. Boil a whole chicken (please season the bird or the water) and pull all of the meat off the bone. 2. Dice and saute bell pepper and onions (1 onion and 1 bell pepper) in a separate sauce pan. 3. Add 2 cans of cream of mushroom soup and 2 cans of Rotel or diced tomatoes with chiles and heat for 10-15 minutes. 4. Layer your casserole starting with the Doritos first. Add cheeses! You can be creative with this step. Originally we always used American sliced cheese. Now I dress it up a bit and toy with different cheeses. This time I am using Pepper Jack! REPEAT all steps until you fill the casserole dish. Normally, this would have been the last step but my mom always topped this casserole with crumbled Doritos. I add a little bit of crumbled cheese myself! Bake the casserole for 20 minutes in the oven at 350 degrees! Serve with refried beans, Spanish fried rice, or maybe . . .